It just all looks so sad and awful. We have been spoiled here for many many years - I think maybe it is time for us all to get real and stop over consuming. I'd LOVE to take the train to work - but would have to walk through a bad part of town to get to my office in the SODO. I'll keep working toward better public transport. 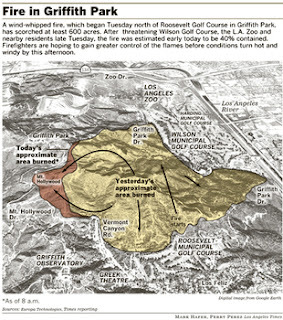 A thought: CA - especially the LA area - has always been dry - always had fires. Not this bad or this early but there are so many nay sayers out there - We need to focus on the places that un-traditionally have fires etc to really get peoples attention. Oh dear, I do remember hearing a little something of it, but did not stop to ponder too long. alas, i regret that your peaceful retreat has been disfigured...i am sure that i can attribute much of your sane mind to those walks! However, i know that you will conquer all--even by helping on the global warming front!